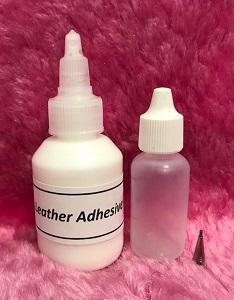 Leather Adhesive Duo Pack includes a 50ml Bottle of water based Leather Adhesive and a 20ml fine tip squeeze bottle applicator for accurate use. Leather Adhesive Duo Pack includes a 50ml Bottle of water based Leather Adhesive and a 20ml fine tip squeeze bottle applicator for accurate placement. In store we used this product when we held Hand Made Teddy Bear Classes. We decanted a small amount of the Leather Adhesive into the squeeze bottle and used it on the edges of the Teddy Bear Fabric pattern pieces once they were cut out to prevent fraying and add some additional strength to the seam. It was particularity important when using real Fur. Use instead of Fraystop. Leather Adhesive is water based, stays flexible and dries clear.